In a year that Philly took a coordinated stand against waste and litter, one sustained effort along the Schuylkill River stood out, ending 2018 with a bang—the kind of bang you get after dropping a 245-ton dumpster. 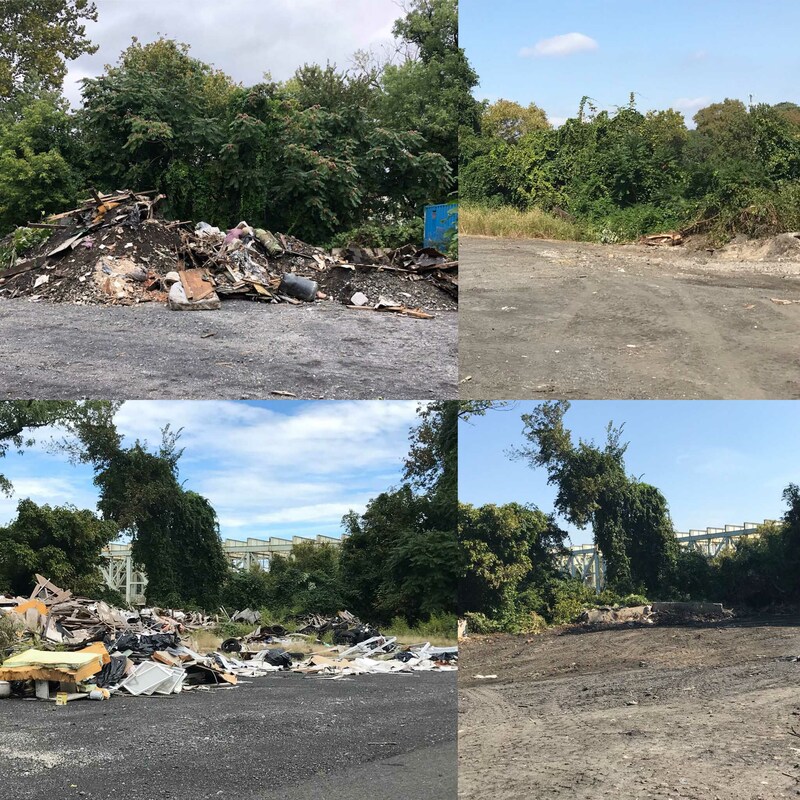 That's the total tonnage Philadelphia Water Department crews, City partners, and volunteers removed from a targeted area near the Falls Bridge during four cleanup days that stretched from late September to the first weekend of December. Volunteers pitched in to help remove over 244 tons of trash from a problem area along the Schuylkill. It all started with a blockbuster three-day sweep that racked up 227 tons of waste in late September. On December 1, we joined volunteers and fellow City departments for a fourth cleanup day focusing on smaller debris, tires, and accumulated litter that was either dumped there or had blown into the area from surrounding neighborhoods. That event heaped another 17.2 tons on for the 244.9-ton total, about what you would have if 32,700 Philly households each dumped a 15-pound bag of garbage along Falls Road. We organized the massive cleanup effort after learning about a short-dumping site where construction debris, tires, and litter were piled high. Located near the Falls Bridge and very close to our two Schuylkill drinking water intakes, the discovery of the illegal trash along Falls Road launched an effort (spearheaded here by PWD Environmental Engineer Maria Horowitz) to team up with City and private partners and take action. The workforce of people on the ground filing trash bags and trucks with litter and tires included citizen volunteers brought there through a three-year partnership our department has forged with the Philly-based outfitter United By Blue. In 2018 alone, United By Blue and PWD collaborated on 12 volunteer cleanups, with the December Falls Road event marking the final collaboration of the year. The 17-plus tons collected that day made the annual total of trash and recycling picked up by volunteers 422,324 pounds. Just under 1,100 people volunteered for the 2018 litter hauls. Volunteer cleanups, combined with regular efforts by our Waterways Restoration Team, resulted in the removal of nearly 3.2 million pounds of trash and debris from local creeks, rivers and their banks between July 2017 and June 2018. Even amid a boost in litter removal efforts stemming from PWD participation on the City’s Zero Waste and Litter Cabinet, the Falls Road cleanup was truly remarkable for the impact and the organizations who participated. Joining PWD on the City side were the Parks and Recreation, Streets, and Police Departments; private partners included United By Blue and Norfolk Southern, a rail company that manages part of the site. While much of the weight came from fill and gravel that accumulated with the debris and trash, the City plans to reuse that material as needed in projects like street repair. Additional efforts to address railroad ties and equipment will be conducted in the upcoming months by Norfolk Southern, and PWD crews are planning more follow up work to continue restoring and rehabilitating this section of Fairmount Park. Going forward: Access gates for the area now have new locks, and signage and barriers have been errected and a to deter more dumping. PWD, Police, and Parks and Recreation and other departments are conducting additional litter surveillance around the site. The Falls Road cleanup netted 437 tires, bringing the total of tires PWD collected and recycled in 2018 to more than 1300. 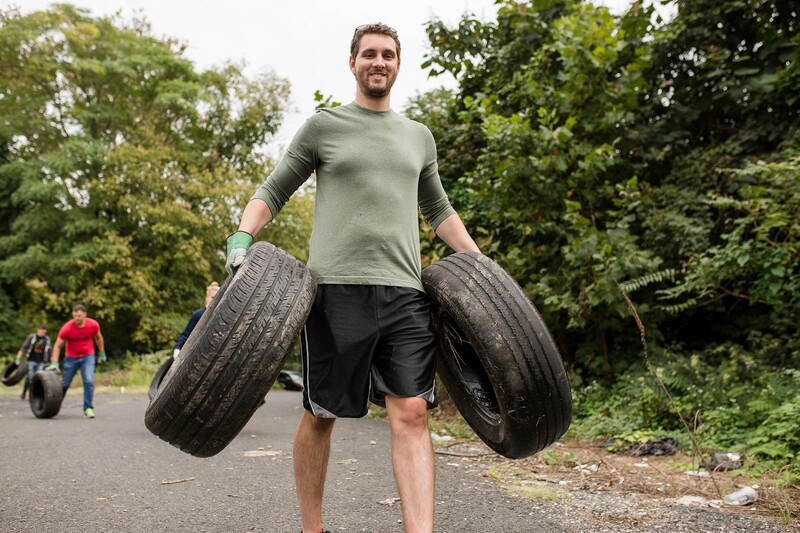 About 1200 of the discarded tires were given new life through the Bridgestone Tires4ward recycling program, which also works with community groups interested in removal. An additional 100 tires colleced at cleanups contained rims and were picked up by a company that creates tire-derived fuel for energy. 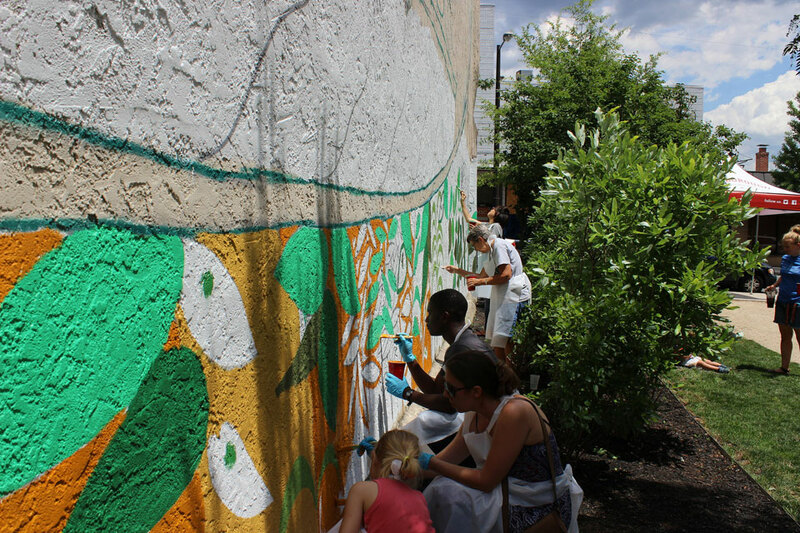 In addition to the Tires4ward program, the Streets Department and Philadelphia More Beautiful offer the Tire Round-Up Program to support community clean up efforts. 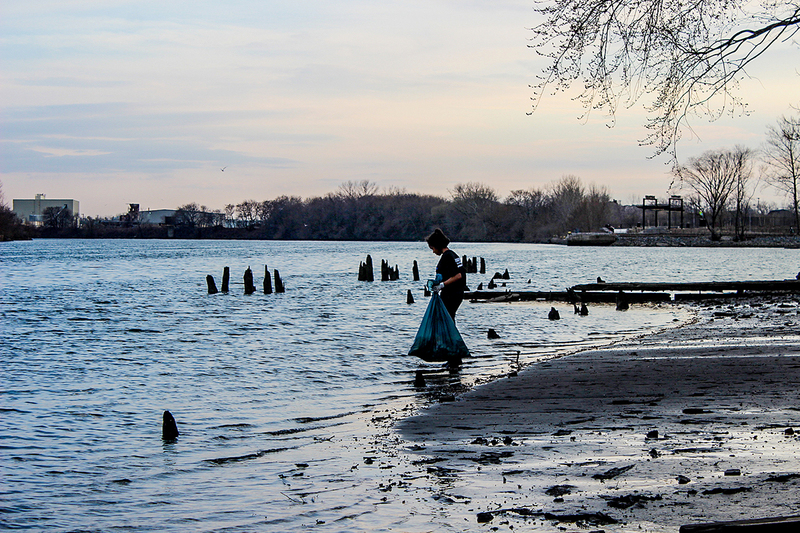 As stewards of the city watersheds, we have long dedicated resources to removing harmful litter and trash from dumping from local rivers and creeks. Growing public awareness about the impact this type of pollution has on our environment has led to the robust volunteer presence we see at PWD cleanups, Love Your Park (fall and spring! ), Philly Spring Cleanup, and in countless neighborhoods every weekend. All of that energy now has a great outlet and organizing resource in the Zero Waste and Litter Cabinet. 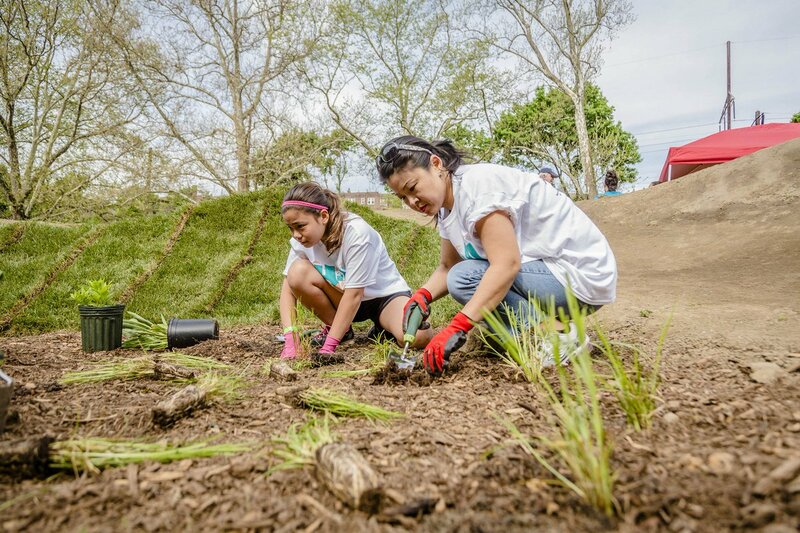 Want to join a volunteer event in 2019 and make our waterways cleaner? Sign up for our email bulletins and we’ll let you know about our next event! After providing your email, you’ll be able to select what kind of info you want from PWD, including news about volunteer opportunities, environmental news, job training and openings and more. Tip: Include your ZIP code to get information about events in your area.